Feral called me about noon on Tuesday which was overcast with a chance of rain. He said he was going to look for oyster mushrooms and maybe hit a trout stream. I asked if he’d like some company fishing so we met up on the Little South Branch (of the Pere Marquette). The stream was clear as glass and it was 2:00 PM with no rain in sight. So not ideal for fishing. I was surprised when he tied a small spinner. He mentioned that he had a bad luck streak going missing fish with minnow lures. They kept getting off or not getting hooked at all. He had sharpened the hooks and it didn’t help. 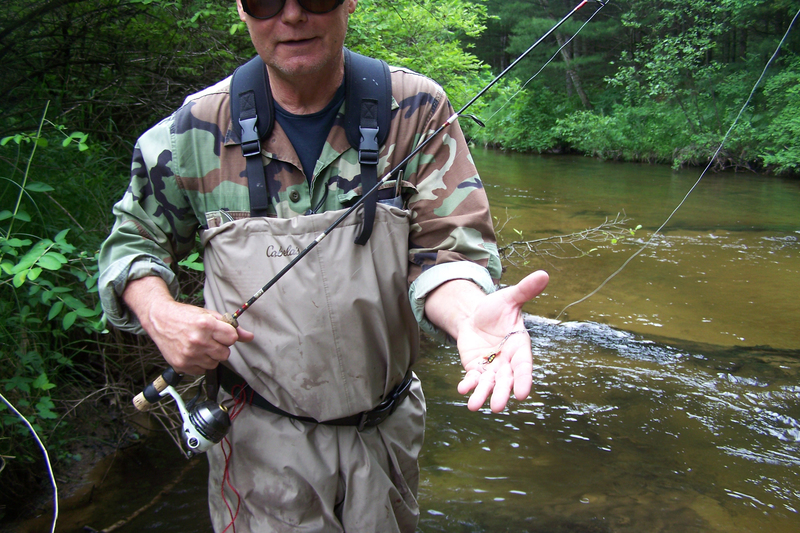 Spinners are good for hooking trout. The trailing treble hook is right where it needs to be when a fish strikes. 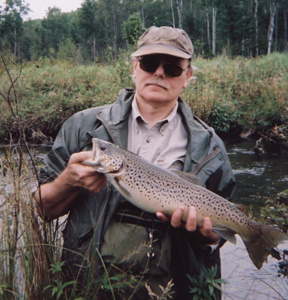 Big spinners have lots of flash which can be enticing to decent size trout but small spinners may not look like much food so large trout may pass them up. Right away Feral started catching small trout that were clearly under the size limit. He kept at it though and soon caught a dinner trout about a foot long. 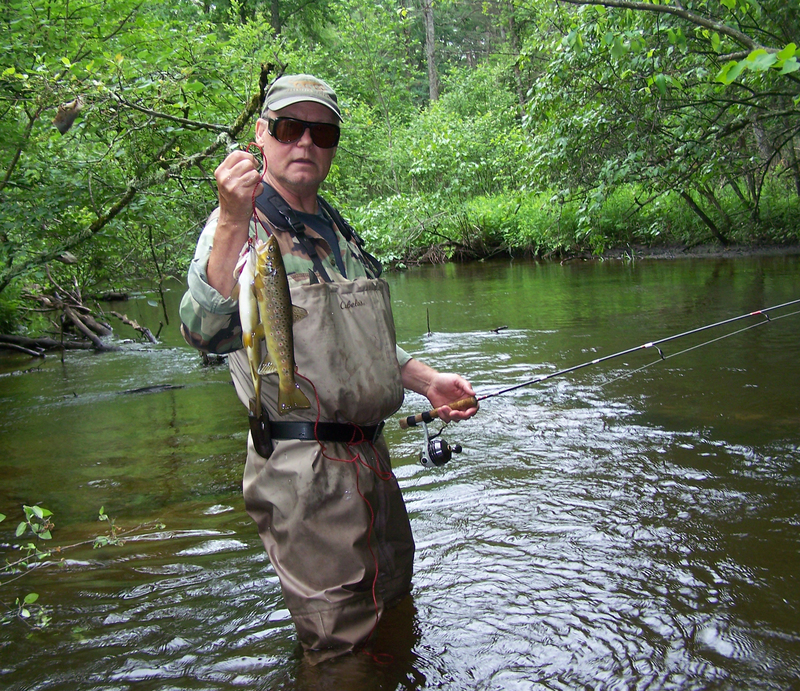 But we weren’t seeing many fish and Feral mentioned once or twice he thought the Baldwin River was carrying some color, meaning stained water or even muddy. That translates to more aggressive fish so we cut out early and headed to the Baldwin. There was a car parked at Bray Creek campground (where Bray Creek empties into the Baldwin) and we figured someone was fishing but didn’t know if they went upstream or downstream. As we talked, standing around in our waders, another fisherman pulled up and was wondering about our fishing plans. His name was Bill. He had driven up from Indiana and wanted to do some fly fishing. While talking to Bill two guys emerged from the stream, just finishing up, so Feral and I decided to head upstream and leave the lower river to Bill. 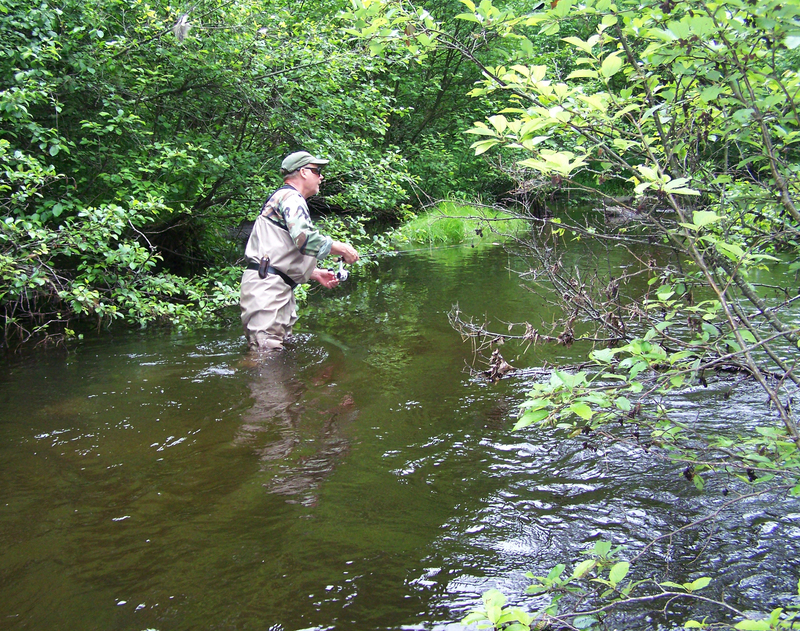 Downstream there are a couple spots open enough to fly fish – if you know what you are doing. We suspected Bill knew what he was doing. He mentioned fishing until dark. Going up from Bray Creek the stream is full of trees and branches leaning over the water, deep holes near impossible to cast and generally a challenge for spin fishing. Feral kept throwing the tiny spinner. The great thing about a small spinner is casting accuracy. Enough weight to bend the rod tip for underhand flip casts. So Feral zinged the small spinner into tight spots and caught small fish, finally getting a second dinner size trout about an hour into the stretch. As he put that one on a stringer I flipped a minnow bait in the exact same place he caught his trout and hooked up with another keeper. By then it was about 5:30 and I had a couple hour drive ahead of me so we cut out early (before reaching the bridge at 40th Street). Back at the vehicles Feral left a note for Bill, the Indiana fly fishermen, to let him know how we did. We mentioned fichigan while talking earlier so maybe we’ll hear back. A few years back on the opener we entered there at the 40th street bridge. We didn’t end up with anything there other than my partner ended up with a few bumps and scrapes from large rocks we couldn’t see. We stopped where there was a bend to the left and the overgrowth became too much. At the beginning though, we did see something rather large jump out and splash right in front of that home on the left side. We don’t know what it was but we were interested in finding out. We then went on to the pere Marquette for the rest of the day. Thank you for your post I enjoy them a lot.